Dr. Ray C. Stedman (1917-1992) grew up in the rugged cowboy country of Montana. Abandoned by his father when he was a young boy and emotionally cut-off from his mother, Ray had a ruggedly independent upbringing. Yet, through faith, he matured into one the great pastors, expositors, and spiritual leaders of the twentieth century. Today's church is filled with pastors and leaders—men like David Roper, Charles Swindoll, and Luis Palau—who consider him their mentor and lifelong friend. Ray was a man’s man, who ended up being the father of four daughters. He and his family lived through the turbulent era of the 1960s and the Jesus Movement, a time of turmoil and heartache for Ray and his wife, Elaine, and a remarkable time of growth and expansion in his own ministry. Biblical teaching (exposition) was Ray's calling and his passion, and he motivated people by the power of the preaching of the Word of God. He also inspired and taught many through the written word. 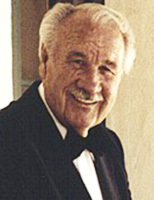 With over nineteen books to his credit, from Spiritual Warfare to his insightful commentary Adventuring Through the Bible, Stedman’s published works span the experiences of Christian life, including Body Life, a book that had tremendous impact on the church in the twentieth century.